With festival of colors approaching, I have a sweet dish to share. The festival of colours, popularly known as Holi in India is a spring festival. It is celebrated with utter enthusiasm in the western and northern parts of India. This festival falls on a full moon day and is celebrated for 2 days, the second day being Rangpanchmi. ‘Rang’ meaning colour, and like any other festival in India, this festival too includes sweets. I am a Maharashtrian, and every Maharashtrian loves Puran Poli. 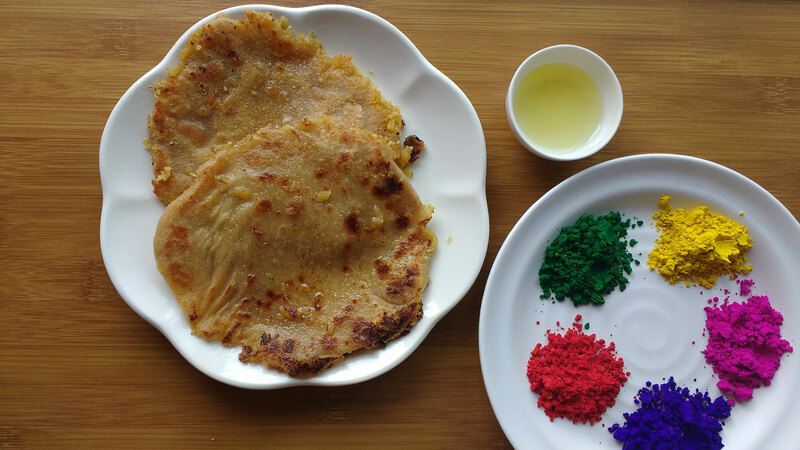 This dish has a sweet filling of Bengal gram daal and sugar, known as ‘Puran’ in wheat flour dough. The daal and sugar (or jaggery) is cooked on low flame. As the sugar melts, the mixture thickens owing to the caramel of sugar that is formed. After which, crushed cardamom and grated nutmeg is added to this which gives it a distinctive taste. It’s the taste of cardamom that hits your tongue just as it should. That’s what I like the most in this dish! This filling is then filled in wheat dough and rolled to make it a flat roti/chapati and shallow fried in ghee. Lastly, it’s garnished with ghee which is spread all over the ‘poli’. Tastes delicious! It melts in mouth evoking your sweet taste buds! So wishing you all a very Happy Holi!! And as the name goes, let this festival add colours to your life and make it more colorful! 🙂 Here’s a glimpse of ‘Puran Poli’.